Riviera Hotel is situated in a fertile land which is of 34 meter square with vineyards and Cyprus acacia trees all makes the look greenish and elegant in nature. This fertile land is situated at the sea side end of country lane in North Cyprus. This is a best hotel in terms of security and privacy as the beach and pools are allowed to use only by the guests staying in this hotel. So it is best for families as they expect privacy and security at the most. 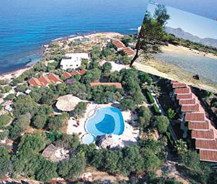 Riviera hotel is situated just two miles from the west of Girne in Karaoglanoglu village. It is surrounded by gardens hence in the air you can feel the smell of jasmine at night times as there will be no pollution. This place is very calm and the only sound you can hear is the waves lapping on the beach and the birdsongs, so this is a best place to enjoy your holiday with privacy and security. Other than this the hotel has 24 superior rooms in which 12 on the pool side and the remaining on the beach side all equipped with high standard facilities. There are also 9 beach side galleried bungalows, 13 poolside galleried bungalows and 6 studios all air conditioned and have all the necessary facilities.